This entry was posted on Saturday, May 7th, 2011 at 12:00 am and is filed under Intermissions. You can feed this entry. Both comments and pings are currently closed. 14 suicides out of 500,000 employees is in fact lower than the suicide rate of the general population (33 per 500,000, according to Wikipedia). Ooh, good research Greg. Love a bit of debunking. But… What then to make of this? 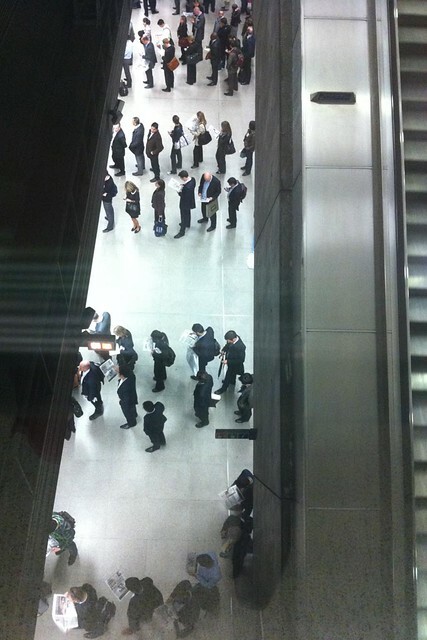 That all that overtime is actually good for you? I think Apple need to be held accountable for the labour practices they exploit for the super profits they gain. But since I typed that last sentence on a MacBrook Pro it means that I also need to be held accountable. Because I am Apple. Because my life is literally lived through my MacBook Pro. It is like my parasitic twin. I could undertake an operation to have the parasite removed, and I would survive the procedure, but having grown so accustomed to its presence I begin to feel it is part of me, and I it. Actually, I sometimes have the feeling that I am the operator thing which allows it to be a living creature. In terms of the parasite, I’m not sure who is hosting who. So if I were to apologise for Apple it would be apologising for myself. We would then apologise for our collective libido. It’s our libido and it’s lust for the prosthetic life we live that drives the collective demand that translates into 450,000 workers at the Foxconn City in Shenzhen doing 60 hour weeks, and working 12 out of 13 days in a row. The question of suicide at Shenzhen is not about comparative rates, it is a question of 14 suicides coming directly from labour practices at Foxconn. I’d like to know precisely what we mean by “general population”, but I’m going to guess that the 33 other hypothetical suicides do not have the same direct cause. Mostly because a city of 450,000 people is not generally a single company’s workplace. Foxxconn city is a 3km square live-in factory that houses nearly twice the population of Wollongong. 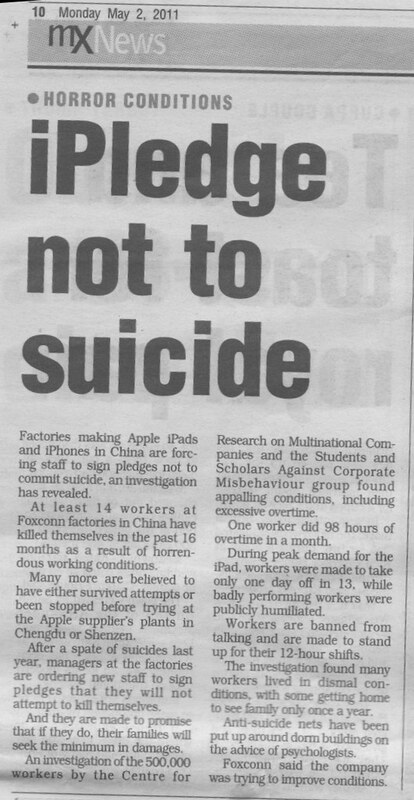 Update: this article entitled “Xbox workers threaten mass suicide” (11 January 2012) shows that this Chinese work conditions problem is by no means restricted to Apple. Update: This American Life has posted an audio story about Mike Daisey, who visited some of the factories which manufacture Apple products in China. And Apple responds.